Working for us: It has been revealed that at least 1,00 former Nazi police officials and collaborators were recruited by the FBI and CIA in the aftermath of World War II to become Cold War spies for the U.S.
Not only did they hire former Third Reich members suspected of carrying out war crimes, they went so far as to help their spies immigrate to the U.S. and cover up their involvement in the war in an attempt to protect them from the U.S. Justice Department’s own Nazi hunters. And that estimate is considered conservative by the historians who were tasked by the government to declassify the war-crime records. 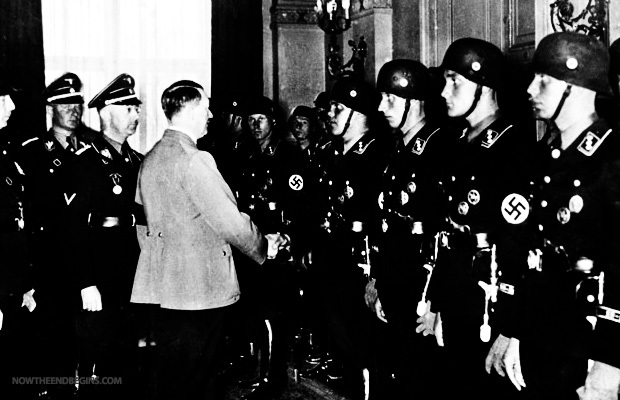 Records reveal that these spies and informants were recruited from every level of the fallen Nazi regime, from SS officers to Adolf Eichmann’s own mentor and ‘master race’ proselytizer. In the 1950s, at the height of the Cold War, longtime FBI Director J. Edgar Hoover and CIA Chief Allen Dulles were in agreement that these former Nazis would be more helpful to the U.S. as Soviet spies than in prison. In Maryland, Army officials trained Nazi officers for a possible invasion of Russia while in Connecticut an ex-Nazi guard was hired to study Soviet-bloc postage stamps for possible hidden messages. In Virginia, a former top adviser to Hitler himself gave classified briefings on the Soviets while ex-SS officers living in East Germany lay surveillance cables and tracked train movements.